Bull Spec issue 2, Summer 2010. Pp. 64. ISSN 2152-5234. $8.00. I tend to prefer full-sized magazines. Digest sized magazines are fine, but in my opinion they’re never going to match holding a glossy, full-sized offering. There’s the extra detail that can be gleaned from the artwork, and the contents appear far less pinched. Fonts tend to be bigger, too. 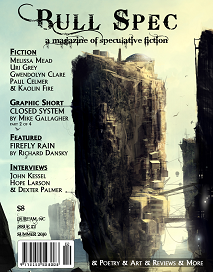 Bull Spec, as you might have gathered, is a full-sized speculative fiction magazine, with colour covers front and rear, and colour first page and last. I thought at first this was a magazine purely for fiction, but in fact Bull Spec is very much compartmentalised in that all the fiction is offered first, followed by a graphic short, then poetry, then interviews and features, and an editorial.. It struck me as an unusual layout—most, if not all, magazines I’ve read tend to interweave such material—and I can’t quite decide if I like this particular way of doing things, whether it felt clunky to read everything in segments. And then I think, why not be a little different in layout? The fiction is of a very high standard. The opener is ‘Echoes of the Bouncing Ball’, by Paul Celmer. At a page and a half, Echoes is one of the shorter offerings. It’s a story of choices, of an off-world gift for a small son; but more so of life choices and their consequences for a miserable or a contented future. That the protagonist, Wheeler, is given a second chance turns what could be a bleak tale into a satisfying one. It’s a thoughtful story well crafted. ‘By the Dragon’s Tail’, by Kaolin Fire, is also very short in length. This feels much more of a traditional fantasy story. After what I felt to be a somewhat vague opening (surely vagueness at the start is a trademark of tales leaning toward higher fantasy? ), Kith is sent upon a quest to seek the dragon’s tail. It’s here the tale, for me, comes into its own. The writing, particularly towards the end, feels much more dynamic and vibrant, and through this and because of the story’s short length, I can forgive the somewhat pedestrian opening. ‘Hirasol’, by Melissa Mead, is a great read. On a distant world, when a landing earth-ship hits and cripples one of the planet’s indigenous, horse-like creatures, there evolves a deeply poignant tale of caring, and love, and choice, and loss. The story unfolds naturally, growing in complexity until we can appreciate all the subtle undertones Mead feeds us and all is ultimately revealed in context of why they’re there and what it means for the earth. I was spellbound by this story from start to last. ‘The Other Lila’, by Gwendolyn Clare, deals with the aftermath of a teleportation malfunction creating two identical copies of Lila. My first instinct was that this was not a new storyline (has this been done already by Star Trek?). But I think Clare adds a subtlety to the idea that makes for a thoughtful read. The two Lilas are portrayed so deliciously similar that the reader has to question just what it is that makes for an individual. And that leads to deeper questions about what is consciousness itself (if you can get the same thought processes simply by replicating a bunch of atoms then consciousness can only be a hardware phenomenon). I like also that Clare thinks about the legal implications of such an accident—which individual is the true Lila? I think there’s much more to this story even if ultimately Clare hints there’s an (albeit somewhat bleak) solution to Lila’s predicament. A fine read indeed. ‘The Sad Story of the Naga’, by Uri Grey, is an odd amalgamation of urban fantasy with a mixing of mythologies (assuming I can call Christianity a mythology). It seems to me this is one of those stories from which I should glean some deep, meaningful message. Yet the meaning always remains elusive, and I’m left feeling a little empty. There’s more unanswered than answered. I Googled Naga and frankly that didn’t help. So whilst this story is nicely written, I personally would deem it unsatisfying overall. Of course, there is the distinct possibility that I’m a bit thick. An excerpt of the novel Firefly Rain, by Richard Dansky, followed by an interview with the author makes for interesting reading. Similarly, a review of The Dream of Perpetual Motion, by Dexter Palmer, when also followed by an interview with the author adds that nice personal touch. I like that in Bull Spec. There’s also a further interview and the transcript of a talk given by author and academic John Kessel. The subject, ‘Imagining the Human Future’, is as relevant today as it was in 2001 when first delivered. Bull Spec editor, Samuel Montgomery-Blinn, included a personal note along with the review copy. In it he says: “I hope to build my magazine into a place not only for stories, but for discussion of the important subjects of our shared future.” Well, my impression of Bull Spec is that he’s doing just that. This magazine comes well recommended.